From birth to around age 5, a child’s brain development is advancing rapidly. 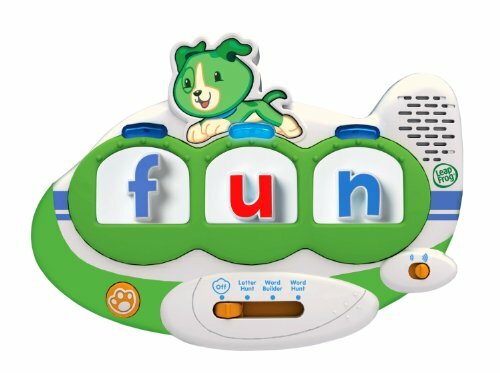 If parents can make intentional efforts to incorporate effective phonics toys such as the LeapFrog Phonics learning system into a child’s daily activities, it will make learning phonics easier and more fun for the young child. Engaging your toddler in phonological play will help your child to pick up letter names and letter sounds. These will go towards helping him to build up the literacy foundation to decoding words at a later stage, which in turn will go toward helping him to read. Toddlers and preschoolers are enthusiastic and energetic learners who love play and fun, so choose phonics toys that are educational, stimulating and fun! LeapFrog has been creating award-winning educational toys to educate and inspire kids for years. Below, I’ll share my reviews of a few of the more popular phonics toys by Leapfrog. March 2015 Update: This is the new version of the Leapfrog Fridge Phonics. 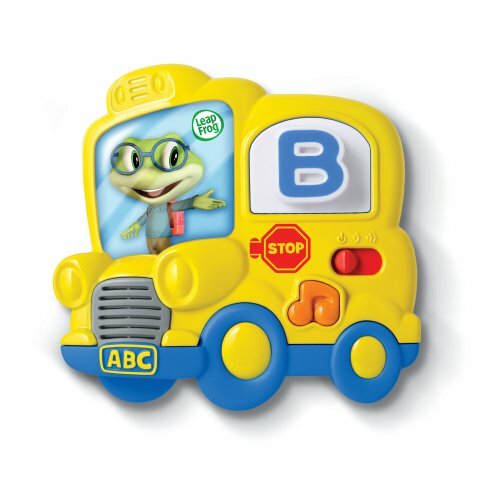 It features Tad the frog in a yellow bus. Besides the Alphabet song, this new version plays “Wheels on the Bus” song too. Kaden has the older version featuring the dog, Scout and you can see it in the main photo shown above. The Fridge Phonics comes with a magnetic tile reader and 26 magnetic letter tiles. We were lucky that my friend gifted my baby son the Fridge Phonics when he was about six months old. 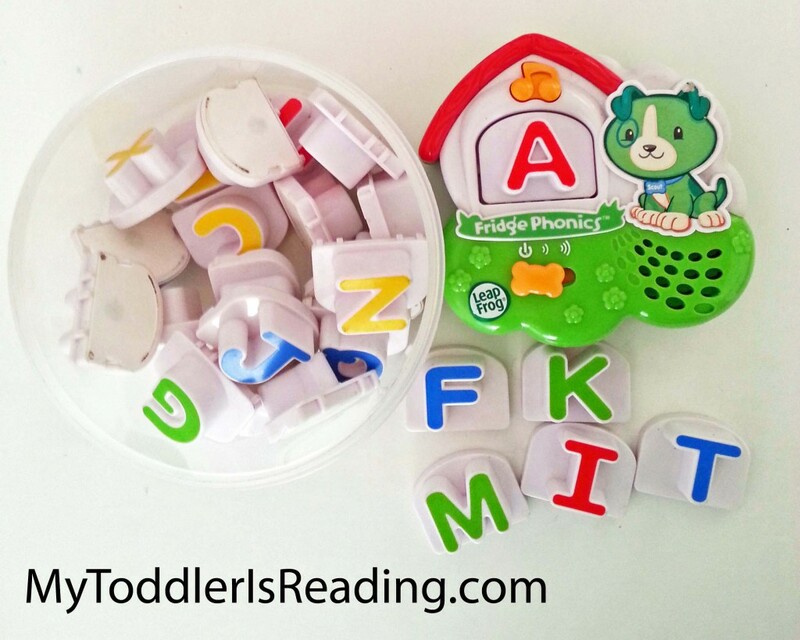 Back then, as a new mom, I didn’t realize it was such a popular educational toy and I also didn’t expect that eventually it would be useful in introducing my son to phonics when he became a toddler. Naturally when he was a baby, his fingers and motor skills were limited, so I was the one who “played” the Fridge Phonics for him to demonstrate the usage of the toy. There’s an orange musical note button that plays the ABC song when pressed. So Kaden would press on it repeatedly. That occasionally saved me having to sing the ABC song to him repeatedly. Over the months as Kaden grew bigger and developed his motor skills, he was able to manipulate and slot the chunky letter tile into the reader slot to activate the corresponding letter name and sound. I feel that this toy has helped him hone his fine motor skills and contribute to building up his phonemic awareness (letter sounds) skill. All this time I didn’t put up the Fridge Phonics on our fridge as it’s a place I didn’t let Kaden go into when he’s younger. Instead, I stored the tile reader and the letter tiles in a box I’ve found around the house. Whenever Kaden wanted to play with it, I would open up the storage box for him to play. When Kaden was about 3 years old, I started putting up the Fridge Phonics on our fridge door so he can play with it when I’m cooking in the kitchen. He would rearrange his letter tiles in the alphabetic order. He just turned 4 in February 2015, and the Fridge Phonics is still in good working condition, and still stuck onto our fridge door. :) Now that he’s slightly older, I would sometimes ask him to spell out very simple words using these letter tiles. He could also form his name with these letter tiles. If you’re looking for a phonics toy that has enduring factor, this would be it. This phonics toy is created based on the award-winning Letter Factory DVDs (sold separately). Designed for children 2-5 years old, the Letter Factory Phonics includes 26 individual letter tiles that can be inserted into the Letter Factory reader. This is NOT magnetic. Like the Fridge Phonics, when a letter tile is pressed in place into the reader unit, it will play a corresponding song and letter sound. 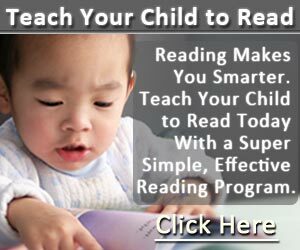 Kids like to press on stuff repeatedly, and repetitive play will let your child practice phonics by learning letter names and sounds. That’s what happened to Kaden. Similar to the Fridge Phonics, the Letter Factory Phonics will introduce letter names, letter sounds and the Alphabet song to your tot or preschooler. It’ll also polish her fine-motor skills. The Letter Factory reader sits atop a bucket design that can store the letter tiles, making it portable and convenient to store away. The Fridge Phonics does not come with a storage box or bucket, so I find this is an attractive feature of the Letter Factory Phonics especially if you’re looking for a toy you can take away with you on trips. This is similar to the Letter Factory Phonics. It includes the letter tiles A-Z and the number tiles 1-10. The main difference is the 10 number tiles. Similar to the Letter Factory Phonics, this reader unit sits atop a bucket which will hold and store all letter and number tiles. You can take the chance to teach your toddler to put the tiles back into the bucket after playing to keep all the pieces intact. Like the above two phonics toys, it’ll teach your toddler about letter names and sounds, and additionally learning to count from 1-10. This playset is NOT magnetic because I saw people who bought this set thinking it’s magnetic like the Fridge Phonics. 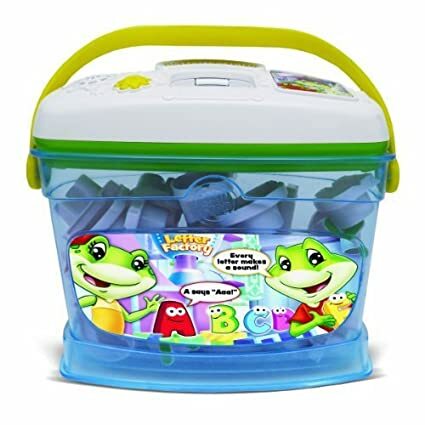 Fridge Words Magnetic Word Builder is also manufactured by LeapFrog. It comes with A-Z magnetic letter tiles and an additional 3 letter tiles so your child can spell words like “MOM”. There are 3 learning modes: Load a Letter, Word Builder, and Word Hunt. I feel that this phonics and word builder toy has more “grow with me” potential in that it not only teaches phonics, but also introduces the child to the concept of word building. Potentially, your child can build over 325 words with this playset! Like the Fridge Phonics, this playset is magnetic and can be attached to any magnetic surfaces such as your fridge or magnetic board. One trouble spot though, I have seen a number of complaints that some of the reader units misread some of the letter tiles incorrectly. So it could be a real problem when you’re trying to teach your child the alphabet. But for people who get the good units, they are more than happy with this word builder which sticks to the fridge and let the kid have hours of fun building up words. If the defective misreading of letter tiles could be corrected for all units, I think this would make an even better choice than the Fridge Phonics. March 2015 Update : It seems Leapfrog has discontinued manufacturing this model of toy, so I’m alarmed by the much higher prices this toy now commands. When I saw it, it was $104.95! 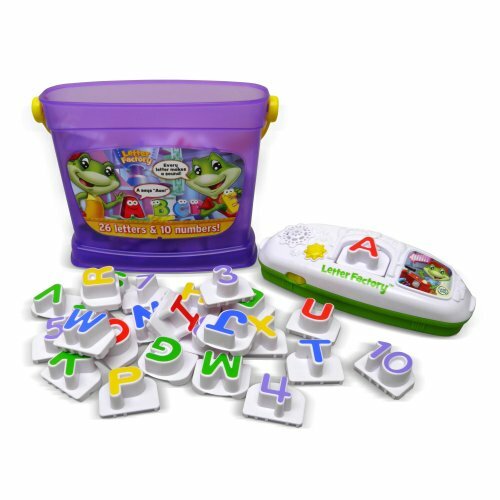 So you might be better off with the new version of LeapFrog Fridge Phonics Magnetic Letter Set.